Heading east toward Austin, the tree is on the left side of the road. The Original Shoe Tree was cut down. This is the sister tree ready to take up its responsibility as the next Shoe Tree of Middlegate. 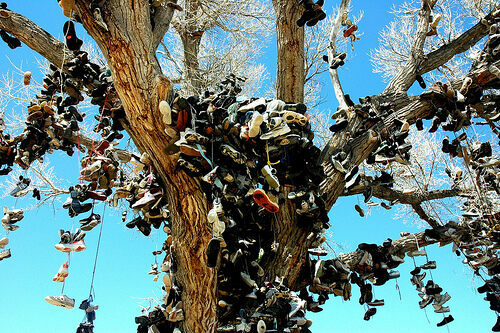 Sorry, The Shoe Tree of Middlegate is permanently closed. 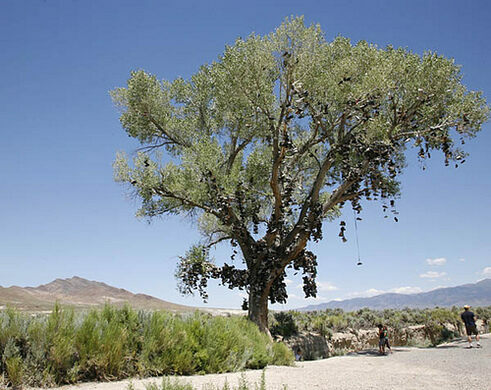 Near the one-horse town of Middlegate, Nevada, on US Highway 50, the so-called “Loneliest Road in America,” set against a backdrop of barren, arid desert and mountains, grows a lone cottonwood tree strung with footwear. Trees decorated with objects–shoes, underwear, gum, or whatever else passersby have handy–are as wholesome as apple pie, and nearly as common in America. 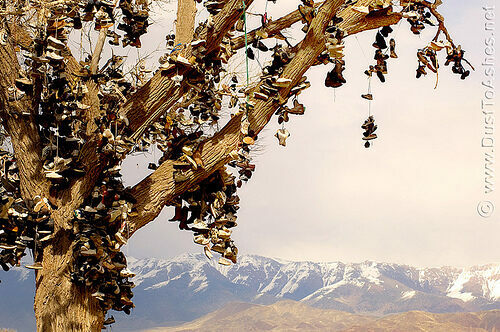 This shoe tree, however, has a particularly good story (and a lot of shoes) attached. This famous Nevada gold mine, once a hotbed of Wild West shenanigans, is now open for tours. This massive crater in the middle of nowhere was used to train astronauts for moon landings. It happened like this: on a warm desert night, a newlywed couple camping beneath the large cottonwood got into an argument. The woman, a quick-tempered sort, threatened to walk away. “If you do,” growled the man, “you’ll have to walk barefoot.” He then proceeded to throw her shoes up into the tree and drive off to a nearby bar, where the bartender, an upstanding citizen if ever there was one, convinced him to return to his wife. He drove back to the cottonwood tree–needless to say, his wife was still there–and the couple managed to reconcile and live happily ever after. They returned several years later with their first child to throw his shoes up into the tree under which they had fought and reunited. The rest, as they say, is history. Witness the footwear of generations gone by. Participate. Drive barefoot the rest of the way. 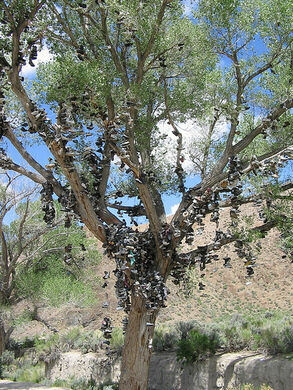 In the summer, the shoes might look from afar like some odd fruit hanging from the leafy boughs of the cottonwood. In winter, they make a particularly impressive spectacle, set against a background of desert frost. 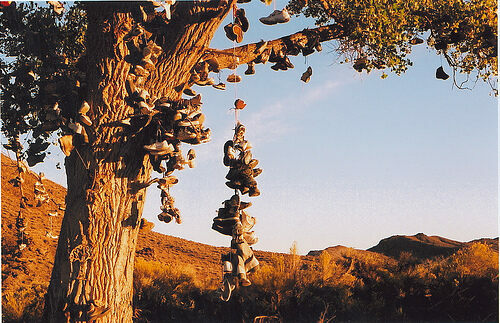 Update 2011: The shoe tree was cut down by vandals on December 30, 2010. 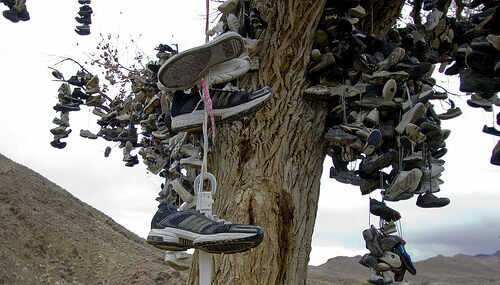 As of early January 2011, Nevada authorities are still in the process of trying to track down who killed the tree. Update 2017: Locals have designated a tree nearby as the new shoe tree, and it is already decorated with an impressive number of shoes. Drive East out of Fallon, NV along HWY 50. Tree is on the North side of the highway between Middlegate and Cold Springs. This Old West eatery along America's Loneliest Road was originally a stop on the Pony Express. This cave was hidden for thousands of years, storing the worldly goods of ancient Native Americans. This mysterious runestone embedded in a church wall is linked to the medieval cult of Saint Erik.